This book is the result of the first comprehensive investigation into a dispute that has been a focus of international media attention. In 1996, Dr. Nancy Olivieri, a specialist at the Hospital for Sick Children in Toronto, identified an unexpected risk associated with a drug she was testing to treat a rare blood disorder. When she began to inform patients of this risk as was required by medical ethics, the drug manufacturer, Apotex, terminated the research trial and threatened to take legal action. This was the opening salvo in a long contest involving Olivieri, Apotex, the Hospital for Sick Children, and the University of Toronto where Olivieri is a professor of medicine. Olivieri said she did not receive the verbal and legal support she expected from the hospital or university. This book is the report of an independent inquiry into the case, conducted by three widely respected Canadian academics. The authors report on their detailed investigation of the events surrounding the case, discuss the charges and counter-charges, and make recommendations for the handling of similar situations in the future. The inquiry was commissioned by the Canadian Association of University Teachers. 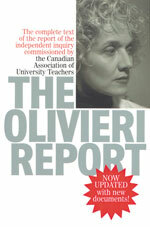 "The Olivieri Report " sells for $24.95. It is available in book stores, or can be ordered from the publisher by phoning 1-800-565-1975.